Structured data is a common topic in SEO. It started a few years ago when Google, Bing, Yahoo and Yandex created a standardised list of attributes which became known as Schema.org. 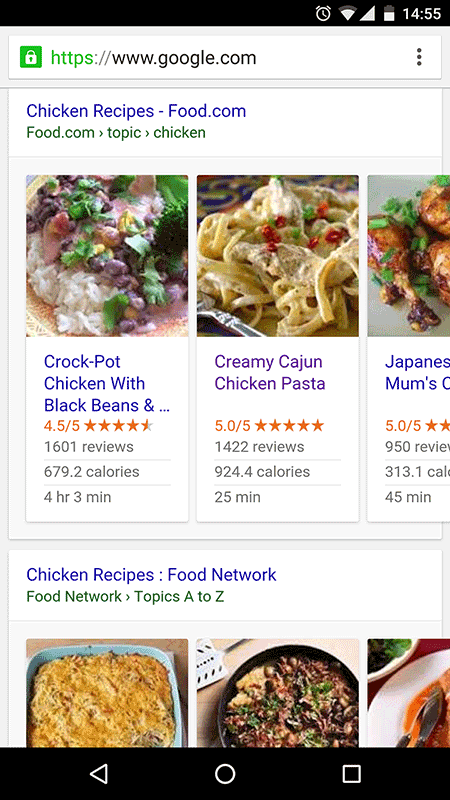 Structured data is a commonly misunderstood topic for webmasters. Many people aren’t sure what it is, what it’s for, and when and how to use structure data for SEO. How to implement structure data opportunities on your website. Structured data refers to any data that is organised by a structure. For example, if you had a bag of M&M’s scattered on a dinner table and you organised the M&M’s into a table with column labelled by colour, you are creating a structure for the items. This is the same as with data. Rich search results: Includes rating, styling, images, and other visual improvements in search engine results. Rich cards: Are a modification of rich search results, they are like rich snippets but intended for mobile users. Enriched search results: Includes interactive search results features. The benefits of the enhanced search results from structured data can improve your click-through rate (CTR) and drive extra traffic to your website. This is because they are more visually appealing and provide additional data to users. Improved CTR can also improve your website position in search engines since it is a user behaviour signal. 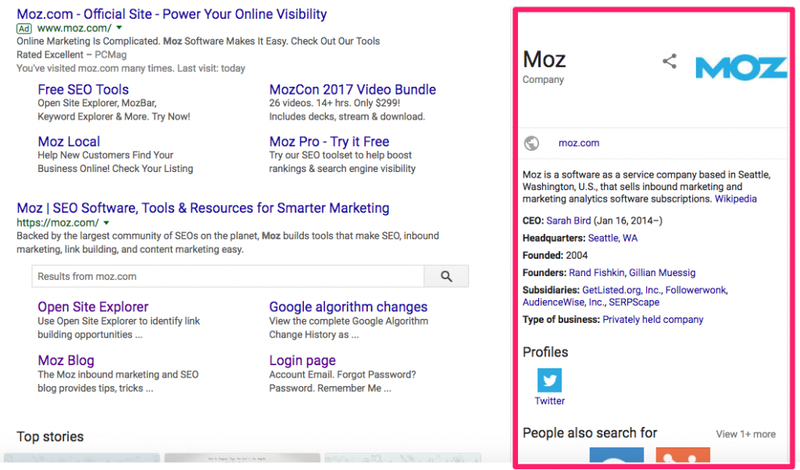 If you have a personal or business brand, you can modify the data that appears on the right-hand side of the search engine results page. Google uses structured data to fill the Knowledge Graph box. Login to Google Webmaster Tools. On the left-hand sidebar click on Search Appearance then Data Highlighter from the drop down. Click the “Start Highlighting” button to start marking up structured data on your website. 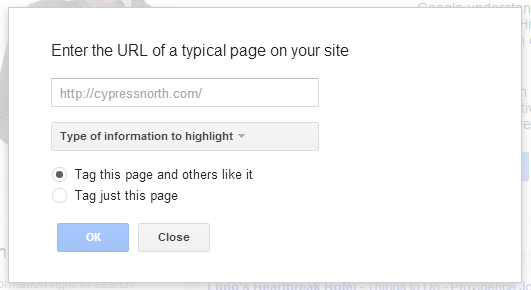 A screen will pop-up and will prompt you to enter a URL of the page you want to start highlighting data on. Start highlighting data with pages that have comparable page layouts, such as a blog posts or product pages. In the drop-down menu, select the category of data you need to highlight. 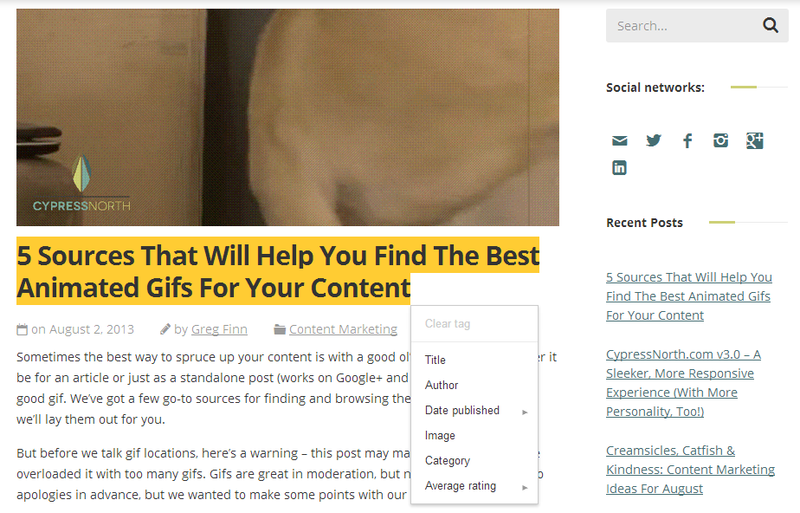 In this example, we’re going to add tags to a blog post, so I would choose “Articles” from the menu. You have the choose to tag just the page of the URL you entered, or that page and others like it. If these pages have a similar layout, it makes sense to tag multiple pages at once to save time. To start highlighting data, all you need to do is take your cursor and select parts of the page, and a list of tags will display. Select the category that matches with the piece of data that you’ve highlighted. It will now display in the right-hand sidebar to illustrate a list of the data items you’ve added tags to. If you tag something wrong, you can delete the tag by clicking the “X” to the top right of the data item. Continue highlighting the data for the rest of the page. Once you’ve added all the tags, hit ‘Done’. Now you can create a page set for similar pages, this means Google will automatically highlight data in the same sections for similar pages. 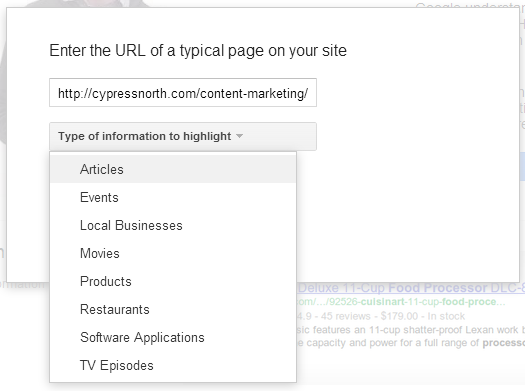 Once you’ve created the page set, the Data Highlighter will ask you to review the suggested tags and fix any mistakes. Go through your pages, and if anything is incorrect, remove the tag on the right side, and re-tag appropriately. If the page doesn’t fit in the page set that you’ve created, you can opt to remove the page. If there is a warning symbol next to the data item, but the item is correctly tagged, you can remove the warning. Once you are done tagging the pages, you’re ready for the final review of the data. You will see a random sample of pages for you to review to ensure the tags correspond to the correct data fields on each page. If these are correct you can publish it by clicking the ‘Publish’ button. The page set will now appear in the data highlighter dashboard. You can create numerous page sets for other content on your website. Just hit ‘Start Highlighting” and repeat the process.